This Type introduced a radical change: the completely new body style was designed, and also initially fabricated, by Carrozzeria Zagato of Milan. 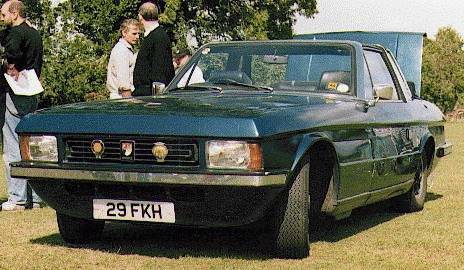 Later series, shown below, were UK-made in their entirety by Bristol Cars Ltd. The body is identified immediately by the angular Zagato styling and the central roll bar. Large rectangular headlamps. Cast Bristol Pegasus badge mounted on the front grille. The 412 engine is a 6556cc (400 cu.in.) Canadian Chrysler V8 induction aspirated unit fitted with the Torqueflite automatic gearbox. The convertible versions have a manually operated folding rear hood section, the top roof section being a removable "Targa" style panel incorporating a sunroof insert that was designed so that when not fitted, it is storable in the Boot. Door windows drop automatically about 25mm to clear the roof when opening the doors. New multicoloured radiator badge replaces cast Pegasus. Headlamps are as the earlier 412. The s2 engine is a 5899cc (360 cu.in.) Canadian Chrysler V8 induction aspirated unit fitted with the Torqueflite automatic gearbox. Stainless steel strip inlet into bumpers. Fuel filler cap is on the top of the left rear wing. Headrests introduced on rear seats. Fixed frames protect the top edge of electric windows. The next of these variants was described in contemporary brochures as the Type 412 USA. 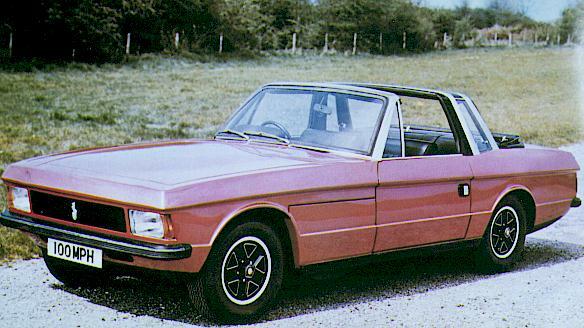 Unlike the British version, it was not supplied with a removable hard top. It was fitted with twinned quadruple rectangular headlamps and large-lensed repeater, running and flashing indicator lights on all four quarters, in addition to those on the front and rear of the car, presumably to comply with American legislative requirements. The engine was also fitted with a catalytic exhaust system. 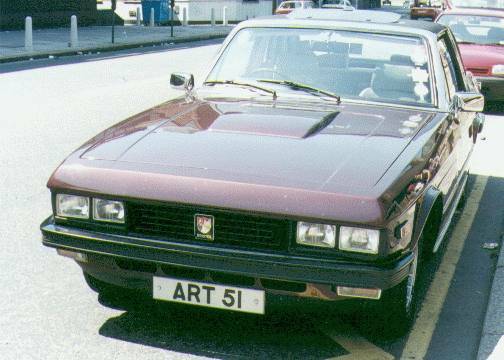 Despite being intended for export to the USA, it appears that this intention was frustrated, perhaps by the a legislative environment that would have presented an ever greater barrier to a small specialist niche company like Bristol Cars Ltd. Only one Type 412 car has so far been traced in the North American Continent, and this is known to be a 412 USA, so it seems there is some support for this hypothesis. Presumably the production lost to the USA was redesignated to be sold in European and other more accessible markets. One model of this type, found in Europe and bearing Swiss registration plates, was pictured on the jacket sleeve of Bristol – An Illustrated History , by Godfrey Oxley Sidey. Perhaps the American-style side flashers on the Beaufighter owe their origin to this model. If anyone has any further information on this model or pictures of an actual example, please contact the BOC Registrar. This was the first Bristol Car to bear the name of one of the celebrated products of the Bristol Aeroplane Company Ltd. As in the Series 2, the Beaufighter engine is a 360 cubic inch Canadian Chrysler V8 unit. In the Beaufighter, however, it is fitted with a Rotomaster turbocharger. The additional torque required not only a heavier propeller shaft: the Torqueflite 3 speed automatic gearbox was uprated with the 440 cubic inch engine's torque converter and internal clutches. Accomodating the turbocharger also required a raised central section in the bonnet. The headlamps are smaller, twinned quartz halogen rectangular units. Flank indicator repeater lights are often fitted to both front and rear wings: these were illustrated as a standard feature of the USA Export version. Standard tyres were 225-70 VR 15 Avons. Only one example has so far been identified in the UK.